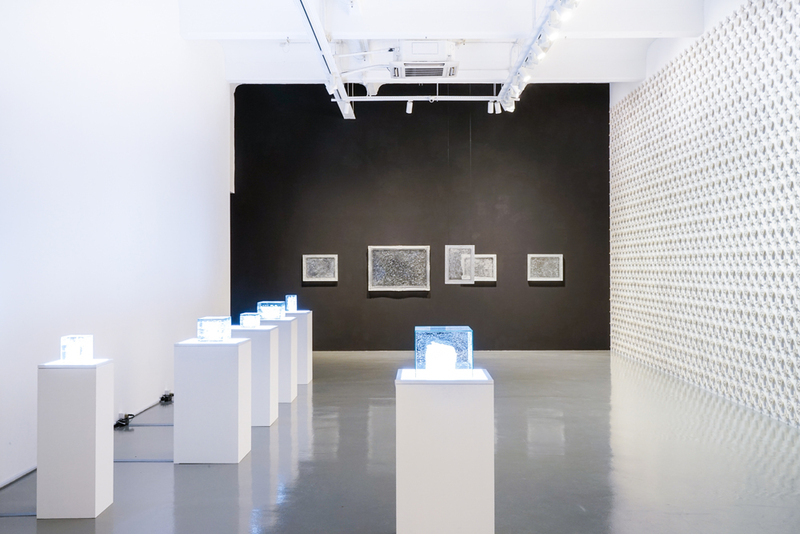 This month on Mizuma Conversations, we put spotlight on artists Albert Yonathan Setyawan and Miyanaga Aiko and their two-person exhibition Radiance currently on view at Mizuma Gallery, Singapore. Moderated by Lourdes Abela-Samson, this conversation was held live at the gallery during an Artists Talk session on the first day of the exhibition. 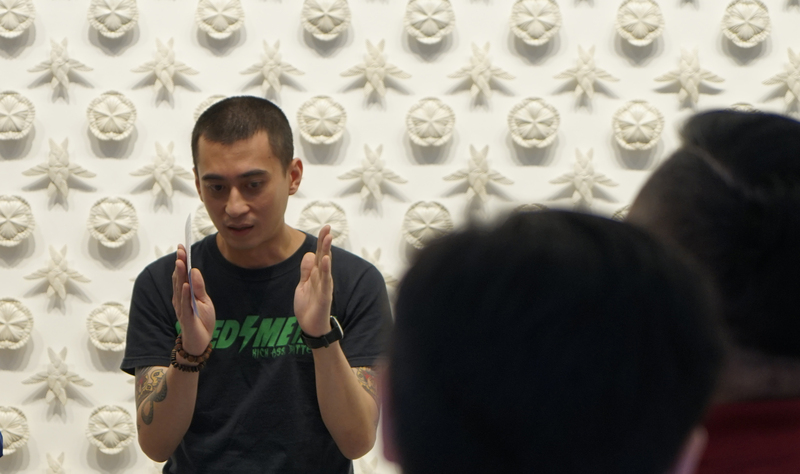 In this session, Albert Yonathan Setyawan and Miyanaga Aiko shared with us their ideas, their explorations into the mediums, the significance of symbolism and imageries that they use in their works, and the working process leading up to this exhibition. Read the full interview with Albert Yonathan Setyawan & Miyanaga Aiko here. Lourdes Samson: Good evening everybody, thank you for joining us for this conversation between two very interesting artists. We have Aiko Miyanaga, who was a graduate of Kyoto University of Art and Design, Sculpture course, and she attended the Master Course at the Tokyo University of Fine Arts and Music. She exhibited across Japan and was awarded the Japanese government overseas study program for artists. Creating sculptures that infiltrate spaces as they inhabit, evolve, and disintegrate, Miyanaga-san uses natural materials like naphthalene and salt to create evocative, ephemeral sculptures that relay the passage of time and engage the viewer’s senses and imagination. With her is Albert Yonathan Setyawan, who was born in Bandung, West Java, Indonesia. He completed his Postgraduate degree at the Faculty of Fine Arts, Bandung Institute of Technology in 2012, and at the ceramic department of Kyoto Seika University in 2016. He is a professional ceramic artist based in Kyoto and is a PhD candidate at the same university, focusing his research on Indonesian contemporary ceramic art. My name is Lourdes Samson, and I am very privileged tonight to speak to these two artists and try to find out the commonalities, as well as the differences, in their artistic practice. From left to right: Lourdes Samson (moderator), Ri Chang (interpreter for Miyanaga Aiko), Miyanaga Aiko (artist), Albert Yonathan Setyawan (artist). These two artists actually have quite a bit in common – both have lived in Kyoto, Japan, and they both have backgrounds in the ceramic arts. Albert, as mentioned is a ceramic artist, and also Miyanaga-san comes from a family of very famous ceramicists, her great-grandfather established a very famous kiln, The Miyanaga Tozan kiln in Kyoto, which is renowned in Japan. But apart from these coincidental similarities, it really is very interesting to find out about the intersections between their works, which are showcased in this exhibition. So may I ask, is this the first time you’ve worked with each other? Albert Yonathan Setyawan: Yes, it is the first time, and it is also the first time for us to meet each other. Lourdes Samson: So how was this collaborative process working for this show together? Miyanaga Aiko: I have previously made an artwork that was a bag made of naphthalene with a key inside of it. It was shown in an art museum in Tokyo. This time, the idea is very similar to that piece of work that I showed back in Tokyo, which has the concept of having Albert’s work inside a basket and as the basket disintegrates, slowly you can start to see the treasure that is inside, and that was kind of the collaboration process for us. If you look carefully right now, by the handle of the basket, there is a small hole (it is really tiny right now) and as time passes, the hole will grow bigger and bigger, and slowly Albert’s work will start to become visible. So although within the glass casing, the basket itself will start breaking down, however, the crystals on the case will start growing and there will be more and more as time passes. If you think about the piece of work as a sculpture, you might say that it is slowly disintegrating and disappearing. However if you look at the artwork as a whole, it is not that the work itself is disintegrating, but that the sculpture is transforming into crystals. Lourdes Samson: And Albert how would you describe the collaboration you did with Miyanaga-san? Albert Yonathan Setyawan: First of all, I would like to clarify that in my personal opinion this isn’t really a form of collaboration, because the idea of a collaboration, if you think about it, actually involves a form of discussion and thinking about the idea together. We didn’t really do that. We spontaneously decided to make something in response to each other’s works, so it’s more a form of conversation, communication, responding to each other’s works in our own way. For example, in Miyanaga’s work, she created the basket using naphthalene and then put my work inside. In my case, I remembered that one of Miyanaga’s work was a book made of resin that she casted from the original book. It’s transparent, so you can see that inside the resin she planted a key made of naphthalene. I thought that work was quite uncommon and interesting, so I wanted to do something in response to that work. I tried to reproduce the same book but with a different material. In this case, I’m using clay, pottery clay, and I try to make it exactly the same as the original resin-casted book. But instead of naphthalene, I planted grass seeds inside the clay. 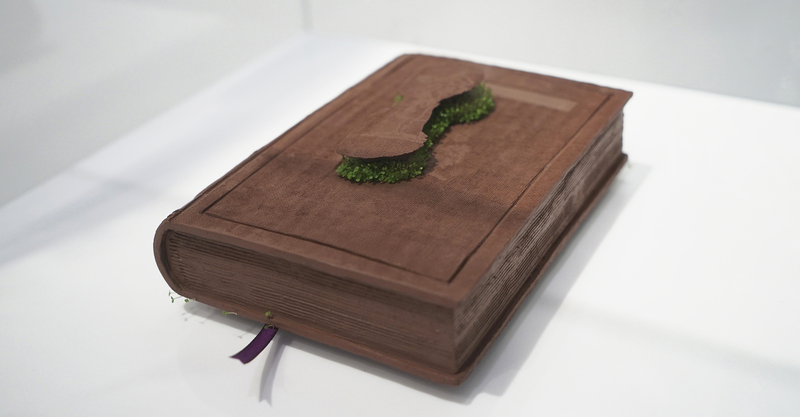 The grass will grow and sprout out of the book, eventually deforming or changing the shape of the book. Also, we are both interested in ideas of impermanence, transformation, and the change from one state to the other. That it is not fixed in one position or one state. I guess we are exploring the idea of transformation as a point of departure in our artistic process. So, I think, it’s a form of conversation rather than a collaboration. Lourdes Samson: Miyanaga-san, when I was doing research for this talk, I came across several articles that mentioned how your works have a very Japanese aesthetic. There is a Japanese concept of wabi-sabi, which is a philosophy associated with the concept of Zen Buddhism. Basically, it is an idea that embraces impermanence and imperfection, which Albert was talking about. So, I sort of understand how your very spare crystalline work may be seen as an application of this philosophy in contemporary art. Was this philosophy something you were conscious of when you were developing your practice? Miyanaga Aiko: Whenever I travel overseas, a lot of foreigners would say that my work is very Japanese. But I did not personally consciously want my work to look “Japanese”. Perhaps it is because I was born and raised in Japan, I absorbed all these elements of Japanese culture, and therefore it is reflected in my personal preferences and it ends up being reflected in my works and how my works look. Lourdes Samson: A writer in the ’60s, Marshall McLuhan, coined a phrase “The medium is the message” in relation to film and other electronic media during that period. 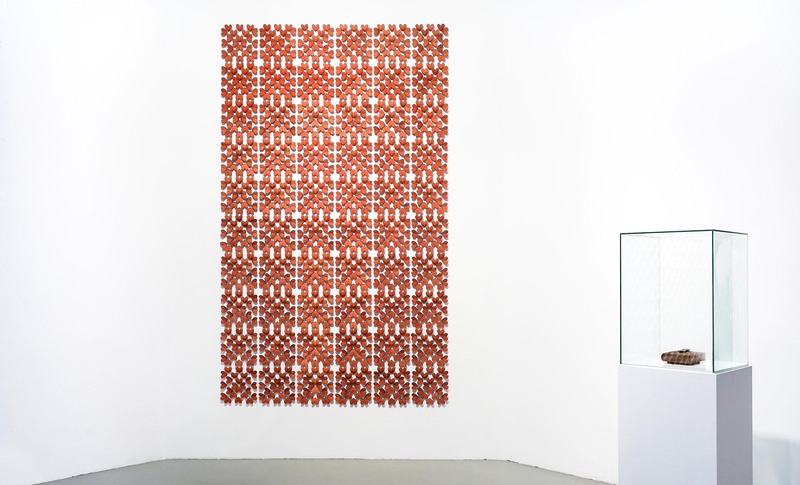 But his ideas can actually be related to all materials that are used in contemporary art. What he meant was that the artist’s choice of medium is part of the meaning of the work, and it influences the way audiences perceive and understand the work. How do you think your choice of materials emphasize the themes that you are exploring in your work? Albert Yonathan Setyawan: I’ve read Marshall McLuhan’s “Understanding Media” and I still have to study that, as it is obviously not very easy to understand that text, but, so far as I understand, what he meant by “The medium is the message” is that – media as we understand, is an extension of our human consciousness and physical existence. For example we have different kinds of tools. But here, he is also criticising about how humans in the ’60s invented digital media, like TV, etc, and that there was a separation between medium and content. That there should be something behind the medium, there’s gotta be something. The problem with digital media in that era is that, when you look at TV, you can see and experience so many things at the same time, simultaneously, and this dilutes and diffuses our senses and content. So, he’s saying that the media itself is the message. The medium is essentially the message. Because once you think that there is something called ‘content’ that is separated from the medium, we are actually confused, because the content itself can be a medium, and the medium is the message. That was what essentially Marshall McLuhan was saying. In his book, he also gave an interesting example about Cubism – how Picasso invented Cubism. What he essentially wanted to do was to give this experience of looking at an object from so many different perspectives simultaneously. So it’s a whole experience of an object. It is composed of so many different perspectives, not just the usual two-dimensional perspective, but also other different point of views on the same plane. In this case, there are so many things that appear in our eyes, the painting becomes holistic. In this case, the painting does not carry any content at all. The painting is the painting. The painting itself is the medium. We can also extend this to Minimalist art, in which the experience of looking at the painting, for example, Rothko’s colour field paintings – they don’t carry any content. We don’t talk about what’s the story behind the painting. The painting is the painting. It’s all about experiencing the colour. Artist Albert Yonathan Setyawan in front of his work, Helios, at Mizuma Gallery. So, if I apply this idea to my works, I’d rather the question be: what would it be like if I make this work in a different medium? Will it create the same kind of experience? 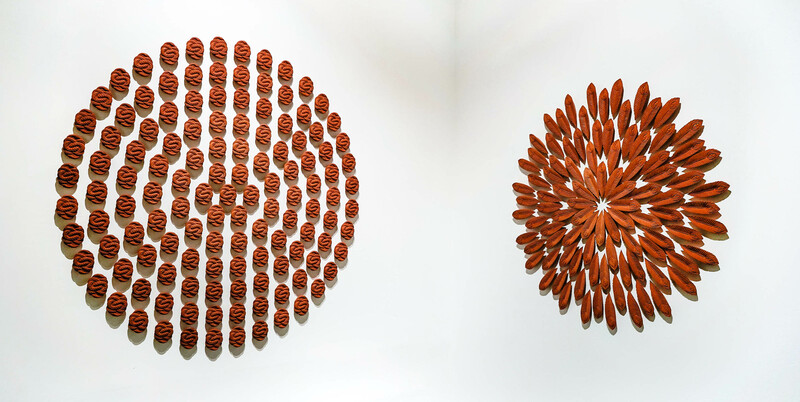 Will people still be able to get the same experience as when they see these works in ceramic? I thought, perhaps, it wouldn’t be the same. Maybe it will be really different. The reason why – it’s because ceramic itself is a really really old medium, even before humans created paintings, there was already ceramic. Ceramic had already been used in so many different cultures. It’s quite primitive in a way, but at the same time it’s still relevant as we still use it in our daily life. Ceramic itself as a material carries so many connotations, so many associations, connected to so many different aspects of our daily lives. We use plates, cups, made of ceramics. Even speakers that we use in our house contain some components made of ceramics. There are so many different types of tools and equipment that are made of ceramic. So, there is a huge array of associations connected to this medium. I think, when I use ceramic, I try to be aware of the conditions. I cannot just use this material and take for granted all the cultural and social associations to this medium. I know there’s that historical association. For example, the reason why I chose this particular glaze (in Helios), is that I wanted it to look old and trigger associations with Chinese porcelain, like it’s something that came from another place, something that came from the past. So, that was my thought in the beginning. I think in a way, I completely agree that the medium carries the message. I think it will be impossible to create these works using another medium. If I were to use other mediums, then I would create different works, which would be completely different, because my ideas were developed from the medium itself, and the medium carries such connotations. Well – that’s what I understand. Miyanaga Aiko: In broader context, I take great care in choosing the material that I use in my works, as that is the beginning of my work. I like to choose materials that I can find in everyday life, and usually, I take the material, tweak something about it, change it, and transform it into a different experience, a different scenery for people. That is what my work is about. Materials mean a lot to me, and impact the message of my work greatly. For me, the most important concept in my work is the idea that the world changes as it continues moving forward. When I first found out about naphthalene as a material that crystalizes at room temperature, that aspect of the material really spoke to me, and it got me to embark on the journey of what my works are about right now. In the world of sculptures, we usually add things – we add clay, or we carve something out of wood, or stone. So to create a work that slowly disappears contradicts what most people understand about sculpture as a medium, and for me, it’s a new beginning to my exploration in my artistic journey. 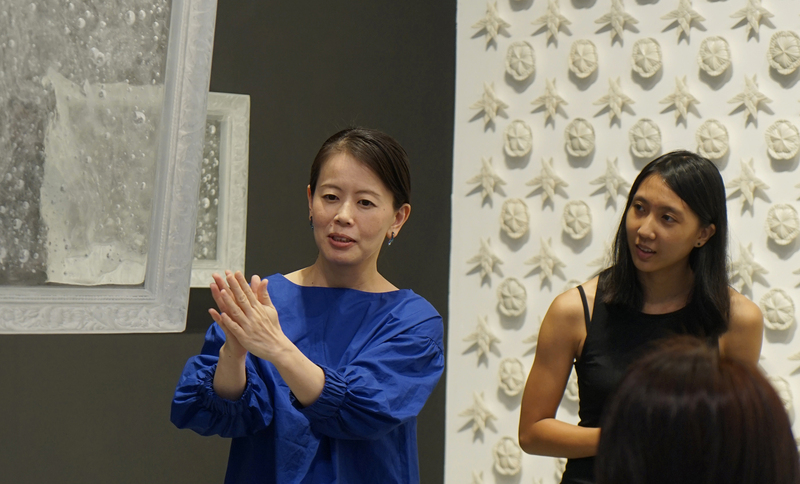 Artist Miyanaga Aiko with her interpreter, Ri Chang, at Mizuma Gallery. Although the unique nature of naphthalene sublimation is something that spoke to me, how I stumbled upon my current form of work is not intentional – I just needed to cover naphthalene as I heated it from below, and in doing so, I started to create the work that you see right now. I found out that the naphthalene is a material that did not just disintegrate and disappear. 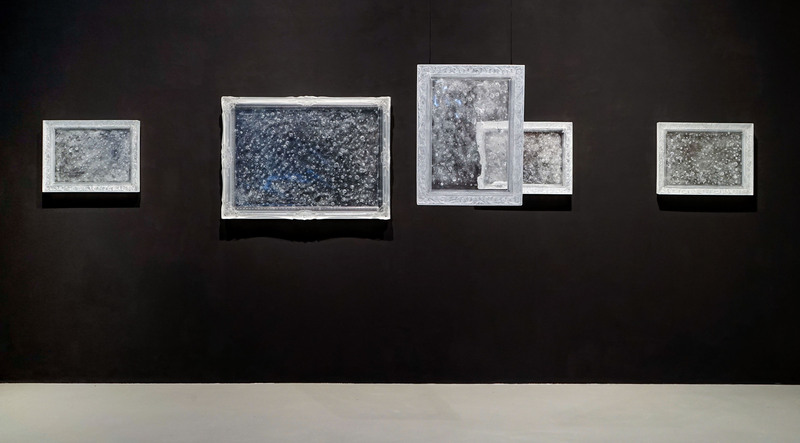 Because I had to put a glass case over it, I realised that it transformed into crystals, and that the work is not just about disintegration but also about transformation. For me, this kind of helped me to rediscover the world view that all of us as individuals, the self, and the world, continues to change as we move forward in life. We are as we are, but we are also constantly changing and transforming, so this rediscovery has now become something that is very important for me and for my works. In artworks in which I use salt, I did not collect the salt from the sea, but rather from the mouth where the river meets the sea, where the river becomes the sea. The process of taking the salt allows me to reflect that although we call them by different names, the sea is the river, and the river is the sea. The duality and transformation of the states are something that come true to me. In my past work, I used fallen leaves. When we see the veins of the leaf, we know that scientifically, water passes through those veins, but by weaving the fallen leaves together, a brand new map is created. 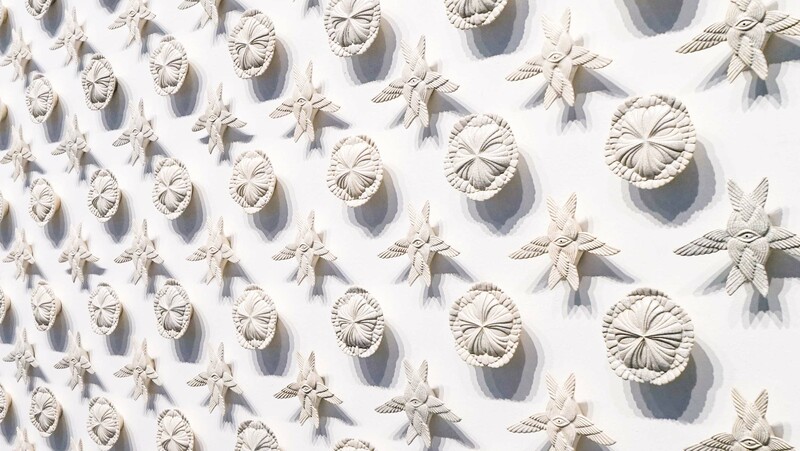 Lourdes Samson: Albert, in your previous exhibition in Singapore, you presented works that talk about man’s relationship to the natural world, as well as a universal spirituality that was manifested in your ceramic wall patterns and floor mandalas. For this show, are these things carried over onto your large-scale wall installations, like Helios which was exhibited at SUNSHOWER, Mori Art Museum, Tokyo last year? Albert Yonathan Setyawan: I guess they still carry the same form of message which I’m still interested in conveying so far. There are many reasons to why I made these works. Partly it is based on my personal experience as a Chinese Indonesian, I grew up in a Christian family. Since I was a child, I was always pretty much involved in church activities. Christianity played a big part in my childhood. So when I started studying art, somehow by looking at artworks, looking at paintings, somehow I felt like I could get the same form of experience that I was always experiencing in church. At that moment, when I was about to graduate from university, something happened in my personal life, in terms of spiritually, that I decided to stop associating myself with activities related to the church, and opened myself to study different religions, especially Buddhism. Although I wouldn’t say that I’m a Buddhist, for a couple of years now I’ve been very much interested in Buddhist teachings, and I try to implement some of the ideas that are present in Buddhist teachings. When you engage in religious activities, like praying, the same kind of experience can actually be experienced through artworks, and that was my personal reason why I was interested in the idea of spirituality. I believe that religion should be something personal and I believe that spirituality is something much more universal. You can talk about spirituality to someone from a different religion, and you still can connect with people, engage with people without any barrier. I think, this whole universal spirituality is a form of awareness of something beyond the physical, something that is always present. Regarding Helios, the idea came from some of the religious symbolisms that are fascinating to me. The six-winged figure came from the Bible, particularly from the book of Revelation, it is an angel represented in the form of part human being, part animal – bird. It has six wings – two covered its eyes, and there are four other wings. They represent light and fire, based on what I know and what I understand. The other shape looks like a flower, but when I made it, I was thinking of light and what can I make that represents light. Based on my personal experience of being in Japan, for the first time I had the freedom to do whatever I want to do, without the burden of pressure from outside in relation to my faith and my personal belief. I was thinking, why do people believe in spirituality, and in the case of Japanese people, perhaps it is the Sun – one of the major gods in Japanese belief, in the Shinto religion. I wouldn’t say that they worship the sun, but there are so many symbolisms that can refer to the idea of the ever-present sun. So, that was the idea for the work. Lourdes Samson: Miyanaga-san, in your works, we see a lot of shoes, keys, clocks – these are some images that you’ve used before. In using shoes, was there any special significance as to why you selected these objects to be embedded into your sculptures? Miyanaga Aiko: All the shoes you see in my works are shoes that have been worn by somebody before. For me, although all they may have the same design as a million other shoes around the world, the moment someone wears them, they became unique, because they are worn in a different way and they have a specific character that makes them special. Within these worn shoes, there is time embedded into the shoes. They tell you a story about the person who wore them – where they’ve been, who they’ve met. Although the person who looks at them may not know the stories, the shoes themselves actually do know. When I casted the shoe, the sculpture produced contains the memories and the stories of the shoe, frozen in time. But the moment it was released from the mould, it starts to disintegrate, and it kind of signifies the liberation of time that the shoe has held on to. This time, my work is a twofold sculpture. The first sculpture is a naphthalene piece that you can see. 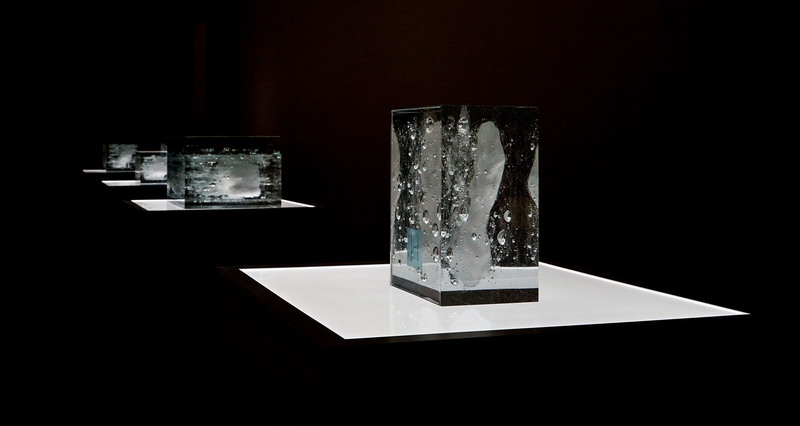 As it disintegrates and as it gets released, the casing captures the particles which crystalize and become the crystal pieces that we see inside. If you lower your eye level, you can see the layers of the work. Every single layer is an individual layer of time collected on top of each other. The shoe has now been transformed into individual layers inside the work. These pieces are called waiting for awakening, and it refers to the time contained within the shoe that has now gone to sleep, hibernating between these layers. Between the layers, we are able to see air bubbles. The shoe is now sleeping between these bubbles of time, waiting to be released. If anyone ends up buying the work, there is actually a seal on top of the work that can be removed, if you want to remove it. 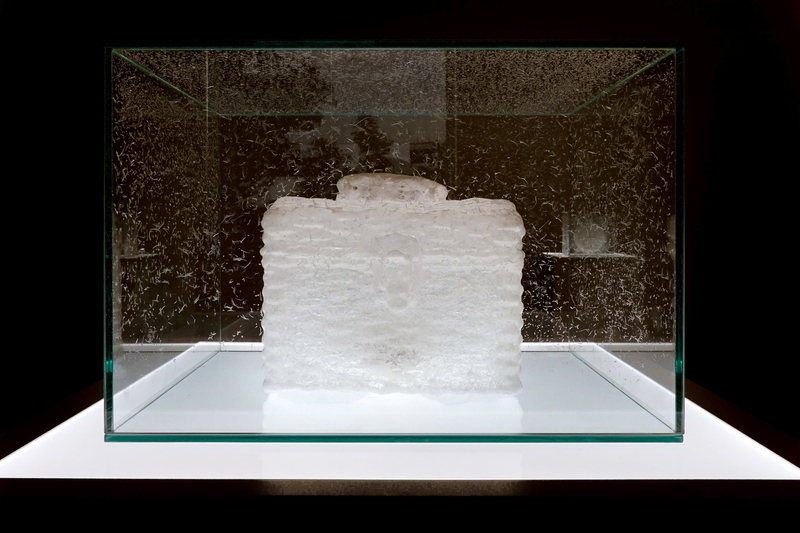 But once it’s removed, the air escapes, and the work transforms from a crystalized naphthalene sculpture to a sculpture of nothingness or absence. But it’s not like it has disappeared or vanished, but rather it has departed, and it has left a trace of its presence. The white part of the work will become semi-transparent. Also, the hole is very small, so it will not be instantaneous, and there is a potential that it may change to become a different kind of sculpture. This kind of reflects and goes back to the idea of shoes, how the person who wears the shoes decides what kind of stories the shoes collect, and similarly, it is echoed when the person who opens up the seal decides what kind of direction the sculpture will take. Lourdes Samson: So, Miyanaga-san has explained to us about her work process. Now I’d like to ask Albert regarding the process of your work – did you cast each and every piece yourself? Albert Yonathan Setyawan: Yes, I cast all the pieces myself. Practically the process starts with creating the models, and making the moulds – usually I make about 10-15 moulds, depending on the amount of sculptures that I wanted to create. Recently I’ve been making some works that did not have any fixed conclusion, so they were ongoing, I just keep making and making them. In my work, I use slip-casting method, so you can reproduce hundreds of objects based on just one object. But after a while, the moulds would wear out, usually I would use them for three, four times a day. Once they got worn out, I would have to carve the shape and details and do it all over again. But that’s the point of my work. I want to have this experience of making or reproducing or being engaged in the same form of activity over a certain period of time. I was interested in this form of “art labour”, where I don’t have to think of inventing something new, I just want to reproduce one single object everyday, over and over again. Will I get bored? Will I get stressed? Or maybe it’s a meditative, spiritual activity, perhaps there’s something religious? I don’t know, but there is a certain degree of commitment. And that is actually what this work allows me to do – to engage in this process. Lourdes Samson: My next question is, what do you consider as the turning point in your artistic career? Do you think luck played a big part in the success that you’ve had so far? Miyanaga Aiko: Unlike Albert Yonathan, I did not have a great start, so I am envious of him in that respect. For me, I’ve always had great faith in the works that I’m doing. The first biggest turning point in my career was when I found naphthalene as a material to use in my sculptures, and the second one was meeting Mr. Mizuma. No matter how much self-approval I have towards my work, it is important to have someone else to validate, to find someone who sees my artworks and wants to showcase my artworks, and wants to own and hold on to my artworks – I feel very fortunate to have these people in my life. Albert Yonathan Setyawan: First of all, I don’t believe in luck. I believe in human efforts. I believe if you work hard, you will be able to achieve what you want. But you have to be realistic, you have to know yourself, your capabilities, and you can create your goals – what you want to achieve. I don’t think luck has anything to do with it. But also, in terms of turning point, I guess this is a question that I can answer in the next 10 years? My first exhibition was in 2007, so it’s just been 10 years, which is very short. If I want to do this as a lifetime thing, then it’s been really short. If I want to do this just for 20 years, then it’s a big deal. But no. I like art, and since I was a child, I wanted to be an artist, although I did not know at that time that there is such a profession, I always wanted to be in this, to make something, to draw something, to create something. So, turning point… I don’t know if there has been any turning point. I feel like it’s been just steps and opportunities that just happened to appear in life. It does not happen because of luck, but it happens because you know what you do, and you feel it’s right, and you just follow what you feel is right, and keep doing it. If you pay attention to things, then you are able to see opportunities, and take the opportunities, and make you do something better, or bigger… so, yes, it’s just about steps. Lourdes Samson: I’d like to open the floor for questions from audience – is there any question? Question 1: Why don’t you believe in luck? Albert Yonathan Setyawan: I don’t know, I can’t explain – but I don’t have any faith or any… luck is just too random? But human effort is something that is real. You commit yourself into something, and you can feel it, you can see it. Luck, seems to me, like something too random. Question 2: Miyanaga-san, on your works that look like frames, there seems to be a trace of an object on its surface, was there any? Miyanaga Aiko: There wasn’t any object on it, actually. This series of works is called life, if you look at the works from the side, you can see many layers. Each frame was laid horizontally, and everyday I would add one layer on top of another, creating bubbles of air in between. I would manipulate the surface of the resin to create more air bubbles. Each layer of bubbles represents time that passed, and within each bubble is the air on that day, sleeping within this frame. So, the air is also incorporated into this piece of work. If you look at the work from the side, you can see the layers, but when you look at it from the front, it looks as if you are looking into the universe. Within one work, you can see different measures and different relationships of time, and all those merge into one, so I call this work life. When the frame is hung suspended from the ceiling and floating, the person standing behind the artwork will be able to see the other side of the frame, and it becomes an artwork about space. Lourdes Samson: Thank you very much everybody, I’d like to thank all of you for staying for this talk. Thank you to the artists, Miyanaga-san and Albert, for sharing your answers with us . Radiance, exhibition by Albert Yonathan Setyawan and Miyanaga Aiko runs till Sunday, 16 December 2018.